Rick Simpson created an acute awareness of cannabis oil by cementing the idea that our health is something we should take responsibility for ourselves. Known for his claim of “rediscovering the cure for cancer” in his use of hemp oil, Rick’s journey is not only about legalizing the use of medical marijuana but also about our right to have access to treatment. 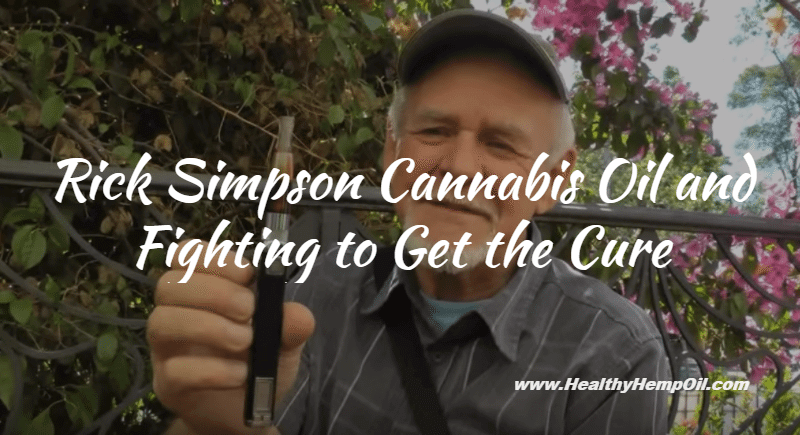 Rick Simpson cannabis oil isn’t founded on product sales but on the belief that a governing medical system should provide ailing people with healthy and natural solutions without political agendas being the pervading priority. If there exists a cure for a disease, why doesn’t the public have access to it? The story of how Rick Simpson impacted the medical world actually starts in the late ’60s, when Rick’s 22-year-old cousin was diagnosed with cancer. The cancer took a serious toll on his body, dramatically dropping his weight from 200 to 120 pounds. This was hard for Simpson to watch, because he and his cousin were raised like brothers. His cousin went through the traditional treatments of chemotherapy. At one point, the doctors even believed they had eradicated all of the cancer. However, by the time he was 25, the cancer came back, and Rick’s cousin was down to about 55 pounds. He died a few months later. Some time later, Rick heard a radio broadcast about a study that suggested that THC is capable of killing cancer cells. This news was reported in passing by a none-too-serious radio host, who laughed throughout the entire segment about the idea of marijuana being a medicine. Rick hesitantly dismissed the report as being a hoax. A few years later, he injured his head at work and was diagnosed with post-concussion syndrome. For five years, Rick took every treatment prescribed to him by doctors. However, they only ever seemed to make him worse. One day, Rick was watching “The Nature of Things” with David Suzuki and learned about marijuana use for medicinal purposes. At that point, Rick was desperate, greatly suffering from his head injury symptoms, and acquired some for himself. This made more of a difference than any of the previously prescribed medications. Rick tried, on multiple occasions, to get a prescription for hemp oil from various doctors, but they would never agree. A year after this, Rick went to see his doctor about some spots on his skin, which were confirmed to be cancerous. One, being near his eye, was particularly concerning to his doctor, so they operated on it. As he was looking at his spots in the mirror after surgery, Rick remembered that radio report long ago about THC. After using hemp oil with THC in it for well over a year now, he decided to use it on his skin. Applying the oil and bandaging his spots, Rick waited four days and was shocked to find the spots completely gone after he took off his bandages. From then on, it has been Rick’s mission to get this information out to people who need help. Since growing cannabis in his own backyard, Rick has been trying to contact any authority that would listen, from politicians to the cancer society, even the UN. By the time his case came around to the Maccan branch of the Royal Canadian Legion, their then president Rick Dwyer was surprised by just how much Simpson was trying to get the word out to the world. What surprised Dwyer even more was the lack of response. There were replies to Simpson’s inquiries, yes, but no one ever came to verify for themselves if his claims were true. Dwyer saw for himself the effects of cannabis when his dying father, who had been told he had barely twenty-four hours to live, took cannabis oil. Needless to say, he lived a lot longer than the twenty-four hours he was given. According to Dwyer, the Legion’s job is to protect the right of free speech and make sure that everything the veterans fought for is upheld. That included calling the government into question when their actions were themselves questionable. Rick Simpson wanted (and still does want) to get this information to people so that they can heal themselves in a harmless and natural way. The foundational idea behind Rick Simpson cannabis oil is exactly that – taking full responsibility for your health. Dwyer questioned the governing authorities as to why they wouldn’t want the same for the people they serve. As president of the Maccan branch Legion, he was proud to stand by Rick’s mission. All those years ago, when Rick was still battling cancer, he almost didn’t use the cannabis extract on his skin because of his own doctor’s reluctance to prescribe it. Rick figured that, if cannabis was a legitimate treatment, then surely the medical system would be using it. He was absolutely dumbfounded by the medical system’s reaction to hemp oil, despite all the incredible testimonials. Today, we see these testimonials not only from Rick and the people he services but also from scientific study and, for example, the various CNN marijuana documentaries. “Rick Simpson cannabis oil” isn’t so much a product as it is a method. What is particularly fascinating about Rick is that he believes strongly in people making their own cure. Therefore, the only shopping page you will find on Rick’s website, Phoenix Tears, is the one at the bottom of the homepage, including nothing more than two books! With “Rick Simpson,” we are informed about his story and cannabis/hemp oil. The pages of his site are filled with nothing but information. You’ll find the right techniques for making high quality oil. What seems to spearhead this philosophy of self-responsibility, so to speak, is, of course, his own past struggle with accessing real health solutions but also his current struggle with swindlers whose only concern is to profit from this new industry. In recent years, Rick has had to deal with people misusing his name for their monetary gain. In a video message on the homepage of his website, Rick talks about people who were seeking treatment being taken advantage of by others pretending to be affiliated with him. Making your own oil will not only help you control the quality of your hemp oil but also help you avoid fraudulent activity. We are supposed to be able to trust in our governing system, but if there’s anything we can learn from Rick Simpson, it’s that no one cares more about your health than you and your loved ones. Finding the right information and methods for yourself takes time and effort, and you’ll most likely make some mistakes. However, making your own medicine is an empowering process and is also a way to learn more about your personal health. Taking responsibility for yourself is a much better alternative to allowing your health to be placed in the hands of people with their own agenda. What is one thing you’ve learned about your health that you wished you knew a long time ago? Share your thoughts with us, and leave a comment below.